Item #15450: 14Kt. Yellow Gold lady's ring with 6x8mm oval Almandite Garnet Cab of 1.79 Cts. and 6x8mm oval Opal of .83 Cts. Size 6 1/2. Item #E-2515-1: 14Kt. Yellow Gold Earrings with eight prong set 3x5mm pear shape Opals of 1.01 cts. TW and two prong set round Diamonds of .04 cts. TW; Post backs. Item #OC-E-5566A3: 18Kt. Yellow Gold Earrings with six prong set 4x6mm & two prong set 7x9mm oval Australian Opals of 3.99 Cts. TW. and eighteen bead set round Diamonds of .18 Cts. TW. Post backs. Item #10949: Lady's 14Kt. Yellow Gold Ring with six prong set 4x6mm oval Opals of 1.70 cts. TW and four prong set round Diamonds of .06 cts. TW; Size 6 1/2. Item #OC-FP-9350: 14Kt. Yellow Gold Pendant with one prong set 6x17mm freeform Australian Opal of 1.72 cts. and four prong set round Diamonds of .08 cts. TW. Item #OC-BH-1658: 14Kt. Yellow Gold Pendant/Brooch with one prong set 6x32mm freeform Australian Opal of 5.70 cts. and two prong set round Diamonds of .04 cts. TW. Item #12759: 18Kt. Yellow Gold ring with 8x10mm oval Australian Opal of 1.18 Cts. and ten round Diamonds of .12 Cts. TW. Size 6 1/2. Item #OC-STP-10-3: 14Kt. Yellow Gold Stick Pin with one bezel set 3x6mm marquise & two each prong set 3x5mm and 4x6mm pear shape Opals of .87 cts. TW. Item #16013: Lady's 14Kt. Yellow Gold Ring with one bezel set approximately 6x8mm freeform Australian Opal Doublet; Select ring size below. Sizes 6 1/2 & 7. Item #MN-AOD-14-69: 14Kt. Yellow Gold Pendant with Avg. 6x9mm freeform bezel set Australian Opal Doublet. Item #OC-E2567-23: 14Kt. Yellow Gold earrings with twelve 3-3.5mm round Australian Opals of 1.10 cts. TW and post backs. Item #10958: Lady's 14Kt. Yellow Gold Ring with five prong set 4x6mm pear shape Opals of 1.10 cts. TW; Size 6 3/4. Item #10973: 14Kt. Yellow Gold lady's ring with five 4x6mm oval Australian Opals of 1.46 Cts. TW. Size 7 1/4. Item #10950: Lady's 14Kt. Yellow Gold Ring with one prong set 7x10mm oval Opal of 1.28 cts. ; Size 7 1/4. Item #15584: Lady's 14Kt. Yellow Gold Ring with one bezel set 7x9mm oval Opal of 1.30 cts. ; Size 6 3/4. Item #HJ202-P3094B: 14Kt. Yellow Gold Pendant with one peg set 5mm round Opal Bead of .55 cts. Item #HJ205-P3094C: 14Kt. Yellow Gold Pendant with one peg set 4mm round Opal Bead of .34 cts. Item #P-3094A-8: 14Kt. Yellow Gold Pendant with one peg set 6mm round Opal Bead of 1.22 cts. Item #SY-113-2C: ESTATE PIECE - 14Kt. Yellow Gold Lady's Ring with prong set 4x6mm oval Opal Doublet; 2.15 grams TW; Size 5 1/4. Item #CSJ-2811: 14Kt. Yellow Gold earrings with two 4.9x7.4mm oval Lightning Ridge Black Opal cabs of 1.44 Cts. TW and post backs. Item #HOO-4265: 14Kt. Yellow Gold earrings with two 6x7.5mm oval Lightning Ridge Black Opals of 1.74 Cts. TW and post backs. Item #SC-TPOP-03: 14Kt. Yellow Gold tie tack with 8x10mm oval Mosaic Opal Douplet. Item #BK-1101-PDT-89: 14Kt. Yellow Gold Pendant with 9x14mm oval Opal Doublet of 1.75 cts. Item #BK-BPO-0811-15: 14Kt. 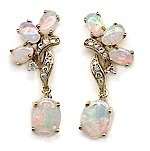 Yellow Gold dangle earrings with 5x10mm Pink Opals, 9x11mm Blue Opals, 6mm faceted Rock Crystal beads and lever backs.